Water boiler need removed from the basement? Don’t break your back lifting it! Try our new Stair Climber! That’s right, this dolly will LITERALLY climb stairs! 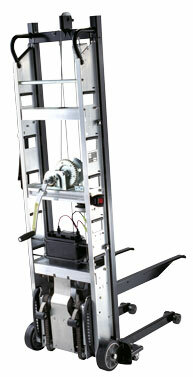 This Stair Climbing Forklift has side frames made from tough tempered aluminum alloy. In addition they have steel lift frames, with 28 inch long forks, for raising loads up to 54 inches – high enough to load or unload a semi truck! All Escalera Forklifts have a 1200 pound maximum capacity.